Like many Snarky Puppy fans, I discovered the band through YouTube videos of their live studio recording sessions. I was blown away by the melodies, the musicianship and the sheer joy of playing. I mean, how many bands do you know will shout in delight and hug each other after a particularly inspired burst of seemingly impossible improvisation? The 40-odd musicians who have passed through the band’s ranks seem more of a family than a band – indeed, they are affectionately known as The Fam – and their blend of jazz, rock, funk and world music makes them almost impossible to pigeonhole. If we must pin a label on them then they are a jazz band but one that is truly progressive, opening up the genre to a mixture of disparate influences. So three cheers for leader and bass player Michael League – I’m full of admiration for what he has done and the way he champions new artists while give a helping hand to older ones. Having said all that, I’m a bit disappointed with Immigrance. I felt the same way about its predecessor Culcha Vulcha, and I think it’s because that’s when Snarky Puppy abandoned the “live in the studio before an invited audience” approach and instead used more traditional recording methods. Perhaps it was a logistical issue of getting 20-plus musicians together in one place on the same day when they are all no doubt in demand as session players, but the result was an album that felt colder, more dispassionate than, say, 2012’s GroundUp or its follow-up We Like It Here. There were still some good tunes but, for me, they only really came alive when the band played them… live. 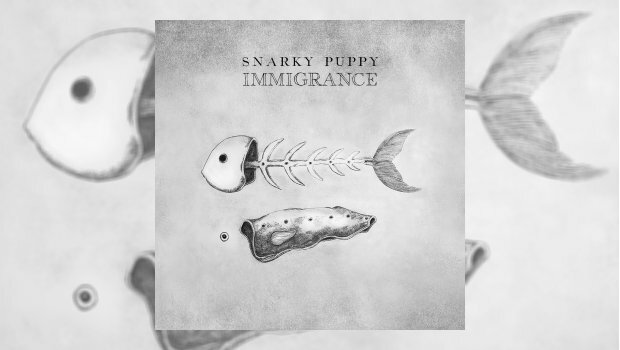 Concert recordings from 2017 – and Snarky Puppy have made practically every gig available as a download – show these songs really jumping and holding their own against the older, much-loved material. Immigrance suffers from the same problem – it feels a bit mechanical, a bit carefully put together. Compared to earlier recordings, there’s an absence of spontaneity, a lack of warmth. There’s also, in my view, a shortage of thumping good tunes. Immigrance is all about The Groove – funk, jazz and hip-hop rhythms with improvised solos on top of repetitive brass riffs. The playing is tight and efficient and the musicianship is, as usual, superb – guitarist Mark Lettieri, in particular, gets a chance to stretch out and impress. But there’s not much here to make the heart soar and the blood sing like GroundUp’s Thing Of Gold, a tune that should replace defibrillators on every street corner. Play it in a cemetery and watch the dead rise up and dance. There are moments when Immigrance almost gets there. Opener Chonks, built on a fuzzy, aggressive keyboard riff, grows into a pounding, dramatic climax. Bigly Strictness (a little Trump dig there?) has a driving menace to it, with a martial drumbeat that sounds like the band are marching off to war, before also building into an explosive finale. Bad Kids To The Back, written by keyboard-player Justin Stanton, has a funky 1980s fusion vibe with lively guitar chops and horn flourishes, finishing on a triple drum solo. But Bling Bling exemplifies the new approach – lots of intricate rhythm parts with staccato horn and keyboard riffs that somehow fail to add up to anything much. Xavi is built on North African rhythms, with a twisting melody supplied first by a lone flute before the rest of the band come in. But once again melody takes a back seat as the band are slaves to the rhythm. And the album has what must be one of the Pups’ most depressing tunes, the dreary and meandering Even Us. We Like It Here ended on the awe-inspiring Lingus, one of the band’s finest moments. Immigrance, however, seems to drop into an exhausted coma. Look, this is not a bad album by any means. The playing, as usual, is remarkable – the drumming, in particular, is powerful and inventive. There are plenty of the band’s trademark Moog solos, lots of furious guitar soloing and the brass section is as tight as Desperate Dan’s Speedos. I have no doubt that, live, some of these tracks are going to go over well – especially Bad Kids and the party vibe of Xavi. But I miss the big, exciting melodic moments. Too often here the climaxes are created not through joyful, uplifting melody lines but by sheer volume of noise – sound and fury signifying nothing, as the Scottish fella said. Immigrance will undoubtedly move your body. But it may not move your heart.